Learn how to embed videos in web pages and insert FLV files in Dreamweaver. HTML5 supports video and audio tags that allow users to play video and audio files in a browser, without an external plug-in or player. Dreamweaver supports code hints for adding video and audio tags. Live View renders the video, providing a preview of the video that you are embedding in the web page. Although you can embed any video in your web page, Live View does not always render all videos. The audio and video tags are supported in Dreamweaver using the Apple QuickTime plug-in. In Windows, if the Apple QuickTime plug-in is not installed, the web page does not render the media content. 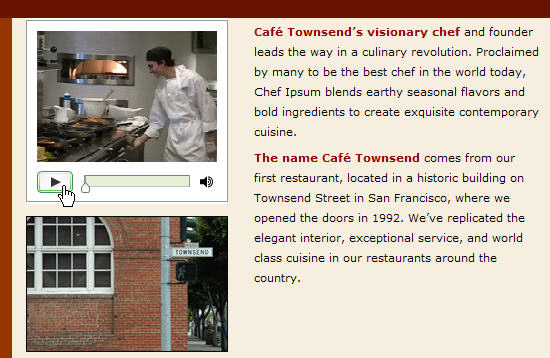 To know how to insert HTML5 video, see Insert HTML5 videos in Dreamweaver. You can easily add FLV video to your web pages without using the Flash authoring tool. You must have an encoded FLV file before you begin. Dreamweaver inserts a SWF component that displays the FLV file; when viewed in a browser, this component displays the selected FLV file, as well as a set of playback controls. Downloads the FLV file to the site visitor’s hard disk and then plays it. Unlike traditional “download and play” methods of video delivery, however, progressive download allows the video file to start playing before the download is complete. Streams the video content and plays it on a web page after a short buffer period that ensures smooth play back. To enable streaming video on your web pages, you must have access to Adobe® Flash® Media Server. You must have an encoded FLV file before you can use it in Dreamweaver. You can insert video files created with two kinds of codecs (compression/decompression technologies): Sorenson Squeeze and On2. As with regular SWF files, when you insert an FLV file, Dreamweaver inserts code that detects whether the user has the correct version of Flash Player to view the video. If the user does not have the correct version, the page displays alternative content that prompts the user to download the latest version of Flash Player. To view FLV files, users must have Flash Player 8 or later installed on their computers. If a user does not have the required version of Flash Player installed, but does have Flash Player 6.0 r65 or later installed, the browser displays a Flash Player express installer instead of the alternative content. If the user declines the express install, the page then displays the alternative content. For more information about working with video, visit the Video Technology Center at www.adobe.com/go/flv_devcenter. Select Insert > HTML > Flash Video. In the Insert FLV dialog box, select Progressive Download or Streaming Video from the Video Type pop-up menu. Complete the rest of the dialog box options and click OK. The Insert FLV dialog box lets you set options for progressive download delivery of an FLV file inserted in a web page. Select Insert > HTML > Flash Video (or click the Flash Video icon in the HTML category of the Insert panel). In the Insert FLV dialog box, select Progressive Download Video from the Video Type menu. Specifies a relative or absolute path to the FLV file. To specify a relative path (for example, mypath/myvideo.flv), click the Browse button, navigate to the FLV file, and select it. To specify an absolute path, type the URL (for example, http://www.example.com/myvideo.flv) of the FLV file. Specifies the appearance of the video component. A preview of the selected skin appears beneath the Skin pop-up menu. The width of the FLV file, in pixels. Dreamweaver determines the width of the FLV file and you can see the width automatically appearing in this field. The height of the FLV file, in pixels. Dreamweaver automatically optimizes the height of the FLV file and you can see the height automatically appear in this field. Total With Skin is the width and height of the FLV file plus the width and height of the selected skin. Maintains the same aspect ratio between the width and height of the video component. This option is selected by default. Specifies whether to play the video when the web page is opened. Specifies whether the playback control returns to starting position after the video finishes playing. Click OK to close the dialog box and add the FLV file to your web page. The Insert FLV command generates a video player SWF file and a skin SWF file that are used to display your video content on a web page. (To see the new files, you may need to click the Refresh button in the Files panel.) These files are stored in the same directory as the HTML file to which you’re adding video content. When you upload the HTML page containing the FLV file, Dreamweaver uploads these files as dependent files (as long as you click Yes in the Put Dependent Files dialog box). The Insert FLV dialog box lets you set options for streaming video download of an FLV file inserted in a web page. Select Streaming Video from the Video Type pop-up menu. Specifies the server name, application name, and instance name in the form rtmp://www.example.com/app_name/instance_name. Specifies the name of the FLV file that you want to play (for example, myvideo.flv). The .flv extension is optional. The width of the FLV file, in pixels. Dreamweaver determines the width of the FLV file, and autopopulates the width in this field. The height of the FLV file, in pixels. Dreamweaver determines the height of the FLV file, and autopopulates the height in pixels, in this field. Specifies whether the video content is live. If Live Video Feed is selected, Flash Player plays a live video feed streamed from Flash® Media Server. The name of the live video feed is the name specified in the Stream Name text box. To enable Live Video Feed, you must select the one of the Halo skin options from the Skin field. When you select Live Video Feed, only the volume control appears on the component’s skin, because you cannot manipulate live video. Additionally, the Auto Play and Auto Rewind options have no effect. Specifies the time, in seconds, required for buffering before the video starts playing. The default buffer time is set to 0 so that the video starts playing instantly after the Play button is clicked. (If Auto Play is selected, the video starts playing as soon as a connection is made with the server.) You might want to set a buffer time if you are delivering video that has a higher bit rate than the site visitor’s connection speed, or when Internet traffic might cause bandwidth or connectivity problems. For example, if you want to send 15 seconds of video to the web page before the web page starts to play the video, set the buffer time to 15. The Insert FLV command generates a video player SWF file and a skin SWF file that are used to display your video on a web page. The command also generates a main.asc file that you must upload to your Flash Media Server. (To see the new files, you may need to click the Refresh button in the Files panel.) These files are stored in the same directory as the HTML file to which you’re adding video content. When you upload the HTML page containing the FLV file, don’t forget to upload the SWF files to your web server, and the main.asc file to your Flash Media Server. If you already have a main.asc file on your server, check with your server administrator before uploading the main.asc file generated by the Insert FLV command. You can easily upload all of the required media files by selecting the video component placeholder in the Dreamweaver Document window, and clicking the Upload Media button in the Property inspector (Window > Properties). To see a list of required files, click Show required files. The Upload Media button does not upload the HTML file that contains the video content. When you insert an FLV file in a page, Dreamweaver inserts code that detects whether the user has the correct version of Flash Player. If not, the page displays default alternative content that prompts the user to download the latest version. You can change this alternative content at any time. This procedure also applies to SWF files. Click the eye icon in the SWF file or FLV file. Click the eye icon again to return to the SWF or FLV file view. This section details some of the most common causes of problems with FLV files. Note that there are two more dependent files for Dreamweaver CS4 and later, compared to Dreamweaver CS3. The first two of these files (swfobject_modified.js and expressInstall.swf) are installed in a folder called Scripts, which Dreamweaver creates in the root of your site if it doesn't already exist. The second two files (FLVPlayer_Progressive.swf and the skin file) are installed in the same folder as the page in which the FLV is embedded. The skin file contains the controls for the FLV, and its name depends on the skin chosen in the options described in Dreamweaver Help. For example, if you choose Clear Skin, the file is named Clear_Skin_1.swf. All four dependent files MUST be uploaded to your remote server for the FLV to display correctly. Forgetting to upload these files is the most common cause of FLV files failing to run correctly in a web page. If one of the files is missing, you might see a "white box" on the page. To ensure that you've uploaded all of the dependent files, use the Dreamweaver Files panel to upload the page in which the FLV appears. When you upload the page, Dreamweaver asks you if you want to upload dependent files (unless you've turned off this option). Click yes to upload dependent files. Because of security updates in Dreamweaver CS4, you cannot use the Preview in Browser command to test a page with an embedded FLV unless you define a local testing server in your Dreamweaver site definition and use the testing server to preview the page. Normally, you require a testing server only if you are developing pages with ASP, ColdFusion, or PHP (see Set up your computer for application development). If you are building websites that use only HTML, and haven't defined a testing server, pressing F12 (Windows) Opt+F12 (Macintosh) produces a jumble of skin controls onscreen. The workaround is either to define the testing server and use the testing server to preview your page, or upload your files to a remote server and view them there. It’s possible that security settings may also be responsible for an inability to preview local FLV content, but Adobe has not been able to confirm this. You can try changing your security settings to see if it helps. For more information on changing your security settings, see Tech Note 117502. If you are having trouble previewing locally, make sure the Preview using temporary file option is deselected under Edit > Preferences > Real-time Preview. Be wary of moving files and folders around outside of Dreamweaver. When you move files and folders outside of Dreamweaver, Dreamweaver cannot guarantee the correct paths to FLV-related files. You can temporarily replace the FLV file that’s giving you trouble with a known working FLV file. If the replacement FLV file works, then the problem is with the original FLV file, and not with your browser or computer. Change the settings for the video on your web page, by selecting the video component placeholder in the Dreamweaver Document window and using the Property inspector. Another way is to delete the video component and reinsert it by selecting Insert > HTML > Flash Video. Select the video component placeholder in the Dreamweaver Document window by clicking the FLV icon at the center of the placeholder. Open the Property inspector (Window > Properties) and make your changes. You cannot change video types (from progressive download to streaming, for example) by using the Property inspector. To change the video type, delete the FLV component, and reinsert it by selecting Insert > Media > FLV. Select the FLV component placeholder in the Dreamweaver Document window and press Delete. To know how to add videos that are not .flv files, see Add Video (non-FLV). You may also want to know how to insert plug-in content in Dreamweaver to play .mp3 files or Quicktime videos in your Dreamweaver site.